SAN FRANCISCO, Calif. /California Newswire/ — Tickets are now available for the World Savvy Gala 2013 on April 11 at the Dogpatch WineWorks in San Francisco. With the mission to educate and engage youth in community and world affairs, World Savvy is a nonprofit organization serving youth and educators nationally from offices in San Francisco, New York, and Minneapolis-St. Paul. The Gala will bring together World Savvy's network of globally minded individuals and raise funds to support the expansion of the organization's programmatic activities. The World Savvy Gala in San Francisco is one in a series of celebration events hosted by World Savvy this spring to commemorate eleven years of work in building a more informed, engaged, and globally competent generation of leaders and change-makers. The San Francisco Gala will feature an open bar of locally crafted beers by Comrades Brewery and artisanal wines from Dogpatch WineWorks, an eclectic menu of food from around the world provided by La Cocina, and entertainment from local performer DJ Kimmy Le Funk. Dana Mortenson, the co-founder & Executive Director of World Savvy and a 2011 Ashoka Social Entrepreneurship Fellow, will give an inspirational keynote speech. Guests will participate in exciting silent and live auctions for a range of exclusive items including vacation packages, spa treatments, gift certificates to premier San Francisco restaurants, and box seats to San Francisco sporting events. Tickets are $100 for general admission. Guests also have the opportunity to purchase a "Champion" ticket which includes general admission for one plus sponsorship of one educator to attend the event. A special ticket price of $75 is available for individuals under 30. 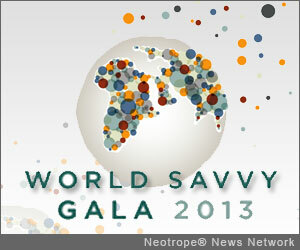 Following the San Francisco event, World Savvy will host a Gala in New York on April 25 and Minneapolis on June 6, 2013. For more information on event sponsorship, purchasing tickets, or donating to the live and silent auctions please visit our website at http://www.worldsavvy.org/ or contact Josie Larimer at Josie[at]worldsavvy.org or 415-813-1681. With the mission to educate and engage youth in community and world affairs, World Savvy prepares the next generation of leaders to learn, work and thrive as responsible global citizens in the 21st century. It was founded in 2002 in response to the critical unmet need for youth to acquire global knowledge and 21st century skills and an absence of quality, mainstreamed global education opportunities for K-12 students and teachers. World Savvy's work supports systemic change in K-12 education to provide every student in every classroom with the content knowledge, skills, and dispositions to be leaders and change-makers in their diverse communities, locally and globally. Since 2002, World Savvy has worked with over 270,000 youth and 3,000 educators, through core programming including youth engagement, professional development, customized consulting, and educational E-resources.